NOTE: If you are reading this in the AutoSleep app and want to read these tips on a larger screen and use the app at the same time, you can press the share button on the bottom tool bar. If it appears hidden, then scroll up and it will re-appear. IMPORTANT: These tips apply to AutoSleep 3.1. This is a free update for all AutoSleep customers. 2 Sleep Calculation Not Right? 2.1 If You DO Wear the Watch to Bed. 2.2 If You DON'T Wear the Watch to Bed. 5 What are all those coloured rings when Tweaking? 5.3.1 Important! If you leave your iPhone in bed, or are prone to knocking it, this will indicate to AutoSleep that you are awake. You are able to turn this feature off in tweak settings / iPhone tab if you find that it is causing inaccuracies. 5.6.1 Important! If you are a non Watch wearing sleeper, make sure that you set your sleep window to commence two hours before you are likely to put your watch on charge for a period of sleep. You will find this in tweak settings / times tab. If you not seeing any data from the Watch, this will show as "time on charge" as when the Watch is correctly functioning, the only time you will see this is when the Watch is on the charger. There are numerous reasons that this can happen. You can follow the troubleshooting steps via this link. Not everyone is exactly the same and sometimes the "out of the box" settings need a little bit of tuning. The good news is that so far, with a bit of tuning we've found that it will work for just about anyone. These instructions are slightly different for people that do wear the Watch to bed, and for those that don't. If You DO Wear the Watch to Bed. The most common problem is the iPhone being moved in the night. This will tell AutoSleep that you are awake. If press the "legend" button below the clock, and then press iPhone. You will see all the times that your iPhone was being moved. When you see that this ring is clear, it indicates that your iPhone has been left alone on a stable surface. When you see that it is dark, it indicates that your iPhone was being used, carried or some other action that AutoSleep uses to determine that you were awake. So, if you notice dark sections during the time that you were asleep that means that your iPhone was being moved. We've found quite a few people that fall asleep with their iPhone in their bed. This will then trigger false usage alerts. In the Wizard you will see the "Use iPhone" section. Set this to No and press OK. If press the "legend" button below the clock, and then press "Move" you will see how you have moved. When this is light green it indicates that your movement level was high enough to indicate to AutoSleep that you were awake. When Dark Green it indicates that your movement level was low enough to make AutoSleep think that you were asleep. Press "Tweak" below the clock and you will see a slider. You can slide this to the right to indicate that you are a more active sleeper, or to the left to indicate that you are less active. As you slide the slider, AutoSleep will do a live re-calculation of your sleep clock. Once you find the right setting for you*, just press OK and this will be then saved. *As you likely have a good idea when you went to sleep and woke up, and a reasonable idea of how often you woke up during the night, you slide the slider until this is roughly represented on the clock in purple. Once you are happy with this, it then adjusts the calculations for the app and you won’t need to adjust it again. The reason for this is due to differences in the Watch, the WatchOS and the metabolic rate of different individuals. For about 80% of people it’s pretty much right out of the box, but some watches and people are different. If you know you were asleep but don't see the purple sleep ring, or you do see the sleep ring yet the sleep time looks incorrect then this is likely due to how you have setup your night hour and quiet time. Autosleep will only look for sleep during times outside of the quiet time. In the wizard you will see two panels. One to set the night hour and one to set the quiet time. If You DON'T Wear the Watch to Bed. For non Watch wearers, AutoSleep uses iPhone motion detection and Watch time on charge. The most common problem for people that don't wear the Watch to bed is the Sleep Window setting. If you want AutoSleep to track sleep based on the time that your Watch was on charge, but this is not working then this is likely due to how you have setup your night hour and quiet time. Autosleep will only capture sleep based on when your Watch was on charge during times outside of the quiet time. In the wizard, firstly check the "Which best describes you section" and ensure that the first switch is turned off and the second switch is turned on. Then progress through the night hour and quiet times panels to make sure your quiet time is correctly set. The second most common problem is the iPhone being moved in the night. This will tell AutoSleep that you are awake. Sometimes, you may have just had a really strange night. It happens to all of us! You can override what AutoSleep has determined by touching the time block that you believe was incorrect. This will then take you into the Day View. You can then press the edit button. This displays some radio buttons. Pressing one will tell AutoSleep to have a look at this time block in the context of those around it and to do the opposite of what it has determined. On the clock, it will then place a yellow indicator on the outside of that time block, to help you see that you have toggled it. You may sometimes find that this has an impact on other time blocks around it, especially in the non Watch wearer mode. You can touch other affected blocks, but, make sure you have tweaked AutoSleep properly to begin with. This toggle feature is purely meant for occasional anomalies. So, please go through the "Sleep Calculation Not Right" section before using this feature. We've done tons of testing on AutoSleep 2.0, but once thousands of people start using it, there will of course be cases where it doesn't work for a few people. If you find that it doesn't work for you, then please let us know! Please email us by pressing here. What are all those coloured rings when Tweaking? When you go into "tweak" mode, AutoSleep adds a few extra rings to the clock in order to help you see the various metrics that it is using to determine your sleep. The above example is a particularly busy one that we can use to explain what everything means. Lets go though these, starting from the outside and working inwards. This ring represents daytime & nighttime. AutoSleep uses your location's latitude and longitude co-ordinates and does some calculations to determine sunrise & sunset for the given date. This helps you to visualise if you are waking up just before sunrise for reasons such as extremely noisy Australian birds. Your location is not stored or transmitted anywhere. Your time asleep is plotted on the clock in purple. If you wear your watch to bed, brighter purple indicates deeper sleep. The next ring is a thin one that shows when you were touching, using or moving your iPhone throughout the day. White indicates that the iPhone was left alone on a stable surface. Black indicates that the iPhone was being used, carried or some other activity indicating that you were likely awake. Important! If you leave your iPhone in bed, or are prone to knocking it, this will indicate to AutoSleep that you are awake. You are able to turn this feature off in tweak settings / iPhone tab if you find that it is causing inaccuracies. The green ring represents how active or restless you were according to your Watch. Light green indicates that you were active enough to register as awake. The various shades of darker green indicate that you were very still. The darker, the more still. You can adjust the sensitivity for what constitutes being awake versus asleep in tweak settings / sensitivity tab. As you slide this, the sleep clock will perform live calculations for your selected day, adjusting sleep accordingly. The red ring represents your heart rate. AutoSleep determines your resting heart rate average for the day. Any reading that is below this average is then shaded red. When sleeping, your heart rate will fall below this average as you enter deeper sleep. The lighter & brighter the red, the lower your heart rate has fallen. Also see the explanation of the sleep quality graph to understand how to interpret this data. A thick orange ring indicates that your Watch was on charge during this period. If you don't wear your Watch to bed, then this is a key metric used in determining your sleep. Important! If you are a non Watch wearing sleeper, make sure that you set your sleep window to commence two hours before you are likely to put your watch on charge for a period of sleep. You will find this in tweak settings / times tab. The Yellow bar is used to indicate lights off. You can learn more about Lights Off in the lights off section. If you notice a yellow outline on a sleep time slot, this indicates that you have manually told AutoSleep that this slot has not been interpreted correctly. You can toggle this off & on by touching a time slot on the 12 hour clock. The needle on the clock will change colours according to the time of day and the day that you are displaying. A red needle indicates that the clock is displaying the current time of day. A light blue needle shows where the day, for purposes of sleep attribution is split. This is particularly useful on the 12 hour clock as (for night time sleepers) it determines the break from AM to PM. (Note: We'll change these numbers to 24 hour format when we translate to more languages). On the 24 hour clock it represents the split in time where any sleep is attributed to the next day. Lights off is an entirely optional feature that lets you track the time that you took to fall asleep. Note: This feature is designed for people that wear their Watch to bed. The easiest way to use this feature is to add the "LIGHTS OFF" Today widget. You can do this by going to your iPhone home screen, swiping your finger from left to right then pressing Edit on the Today view. If on an iPhone 6s or 7, you can also force touch the app icon. When you turn your lights off to go to sleep, simply touch the switch. Note: You do not need to unlock your iPhone to do this. You then do not need to do anything else. From here, everything is automatic and the AutoSleep app will reset your switch for you in the background once you are awake after you unlock your iPhone. The Lights Off time will then show on your sleep clock as a vertical yellow bar and the time that you took to fall asleep will be displayed in your sleep quality analysis. If you need to correct or remove the Lights Off entry, you can either touch the vertical yellow bar on the clock, or go into Day View and press the lamp button. 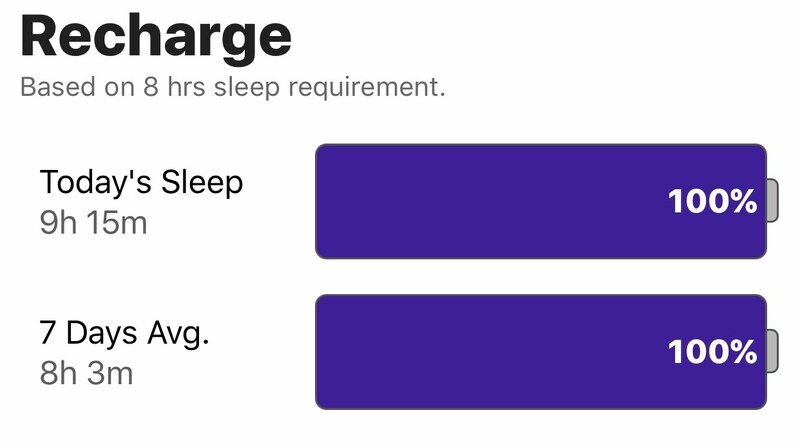 The sleep recharge section lets you see how your "batteries" have been recharged according to the amount of sleep that you have had versus your sleep requirement. Note, the sleep requirement defaults to 8 hours, but you can change this in the Wizard. 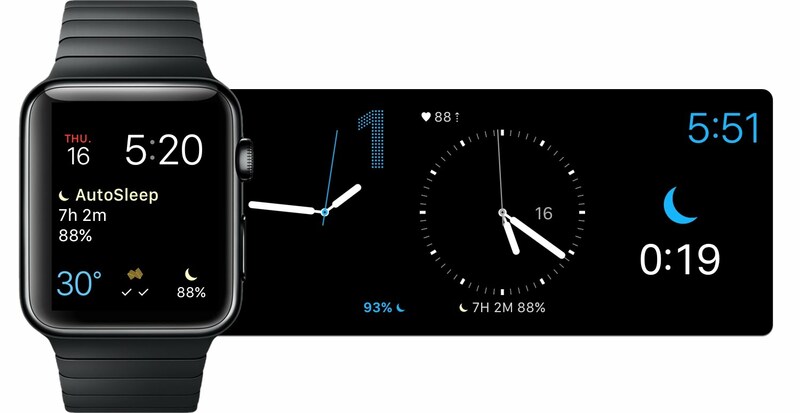 Note: If you are using HeartWatch 3.1, these same figures are now also shown in the calendar, dashboard and vitals section. There is a difference in this information based on whether or not you wear your Watch to bed. If wearing your Watch to bed, the time and recharge percent is based on actual time asleep. If not wearing your Watch to bed then it is based on the simple recorded sleep time. The Watch app is entirely optional. It is not used to track sleep. It is used as an alternative to the recharge & lights off widgets explained above. 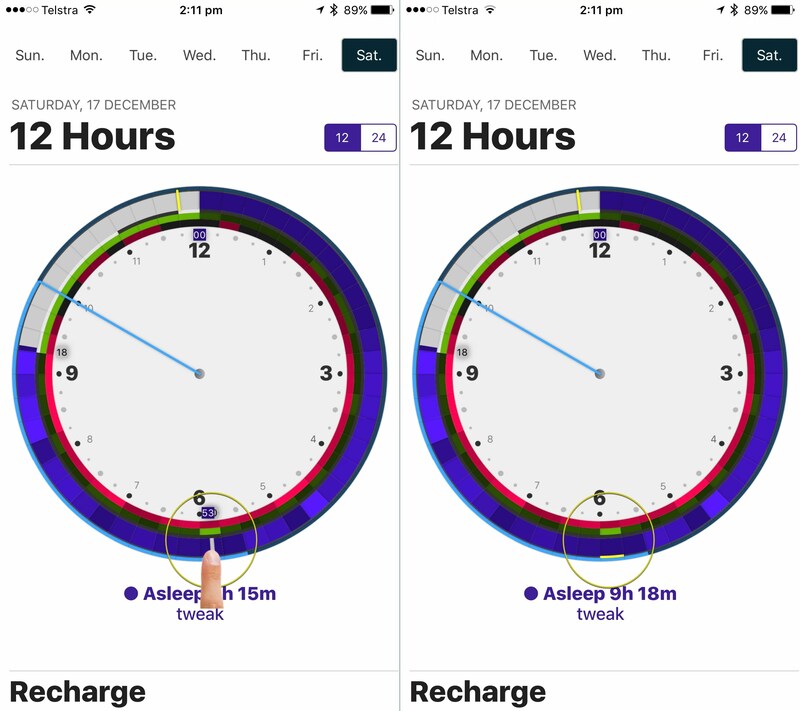 By default the watch app will show you your latest sleep recharge percentage (as described above). If you prefer to use the lights off feature via the Watch instead of the widget, then scroll and you will see the lights off switch. Once you press this, the Watch app will display a timer. It will remain in this mode until you open the iPhone app, which is responsible for all the sleep analysis. 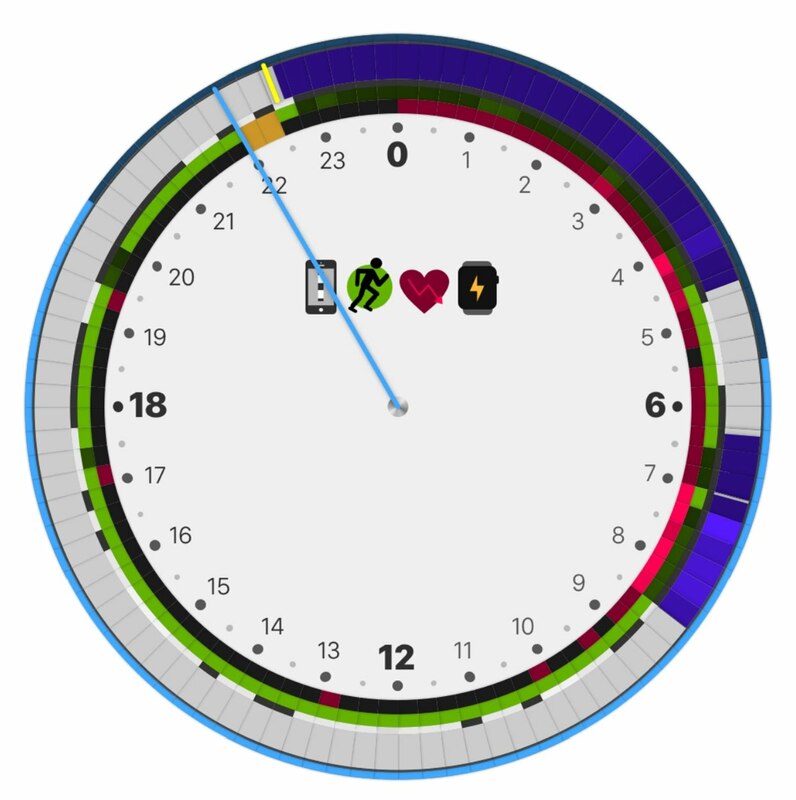 The AutoSleep Watch app has a selection of complications. They mirror the details displayed in the Watch app. That is. if you have activated lights off, then they will display the timer. Otherwise they will show you today's sleep recharge. Larger complications show the time and percentage. If you wear your Watch whilst sleeping, AutoSleep will show you a sleep quality section. Here's what it all means. 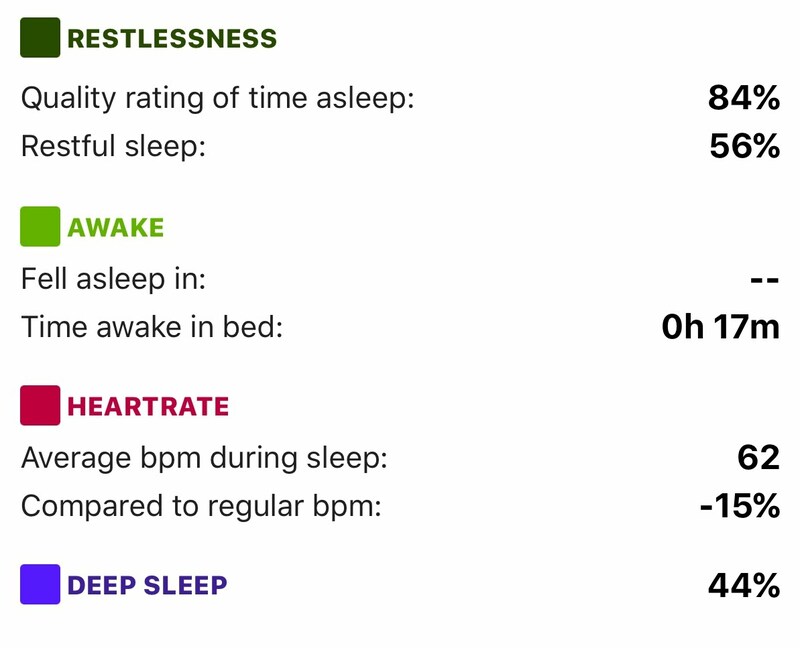 Using your required sleep hours (this defaults to 8, but can be changed in the wizard), total time asleep, level of restlessness and considering heart rate, AutoSleep uses an algorithm to provide a quality rating for your night's sleep. This can exceed 100% if the time asleep was very long, or sections of your sleep were of very high quality. The sleep quality graph displays what was happening whilst you were sleeping. It breaks things down into 15 minute sections for easy analysis. These blocks indicate periods that you were asleep. The higher they rise, the more restless you were. If you were completely still, then they are displayed as a flat dark green square. These indicate a waking moment during this 15 minute period. These indicate a heart rate that was the same or higher than your average resting heart rate for the day. These indicate that the sleep was likely of lower quality. These indicate a heart rate that was lower than your average resting heart rate for the day. The brighter, the lower. Generally, when you see these dots descending, when combined with less restless periods, it indicates that you were in deep, quality sleep. These indicate periods of deep sleep. As per the dark green blocks in the graph, this section looks at the time that you were asleep and how much you were moving about. In the above chart, it indicates that 84% of the time asleep was spent with a low level of, or no tossing & turning. The Restful sleep percentage is the percentage of time asleep that you were completely still. If you use the "Lights Off" feature, this section will indicate how long it took to fall asleep after turning off the lights. It will also look at the total time in bed and calculate the time that you spent awake during this period. If using Lights Off, the time to fall asleep is included in this total. This displays your average heart rate whilst you were asleep. It compares this to your average resting heart rate recorded for the day, that is, it excludes any time that you were active or working out. It displays this as a percentage. Ideally you should be seeing at least a 10% drop in average heart rate, as this is a good measure of deeper sleep. This displays the percentage of time that you were in deeper sleep.